I had to size the pattern down quite a bit in order to fit Elise's little newborn bum- but the end result? She's so beautiful. Look at that hair. That soaker looks nice and cozy for her little bum too. She is so delicious! May you know much joy from her! OT, I am making Aravis with Aran Organic Merino from indigodragonfly and it is wonderful! Thanks for the pattern! Awwwwwww. Sleeping babies are the sweetest, ever. Glad you find time to knit some. Hope you're sleeping a bit, too. that is SO cute!! I love that book! Every pattern is a winner :-) She's precious too. Oh, she is SO gorgeous. PS really hoping I will have time to pick up needles over Christmas break, because Aravis is calling to me! she is adorable, enjoy every minute they grow so fast! As a mother of a 22 & 25 yr old, I miss those times. OMG how adorable!!! It is so hard to believe the 2 year old who runs around my house like a mad man was ever that tiny. OMG...she and it are adorable! Great job! She is just precious, so adorable! The soakers are nice too. She's so adorable and am so glad you got your "knitting fever" back! Oh my goodness - she is the sweetest little cutie pie! And I think she looks awesome in mommy's handmade knits!! oooh, the cuteness!! she looks so precious. great soaker! OMG! What a cutie. Makes me wish (for a moment) that I had one--even though my "baby" is soon to be 35 (on 30 Dec) and she has a 6 year old herself. 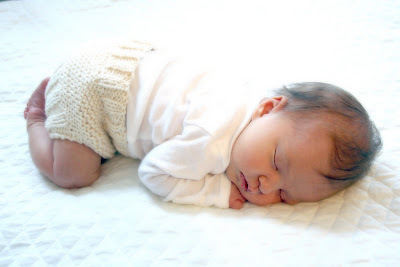 Babies are so precious and fun to knit for since everything is small and doesn't take a long time to knit. I really enjoyed knitting for mine and my grandchildren. Take care and take time to enjoy her--they grow up so fast. She really is precious and we love seeing pictures. Oh my gosh --- how adorable and so retro! Aww, so adorable! 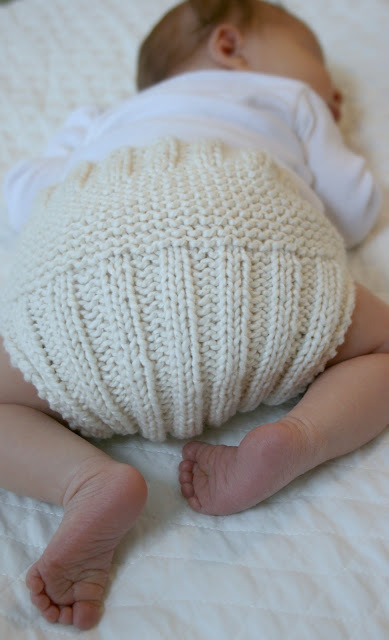 I love baby bums in wool soakers! Beautiful baby and beautiful cloth diapered baby bum. Oh she is precious and how adorable does she make those soakers look! Adorable! And I love the soaker too! It could not be cuter!!! Adorable Elise and so are the bottoms! What yarn? SO precious! Look at the dark hair. That is the most adorable thing ever! Congratulations on your little Elise! Babies are the best creative projects ever! I have that book and haven't knit any of the projects yet and now I'm feeling completely compulsive about it! Thanks.